PotentQ is a simplified and streamlined version of Potent, our mainstream potential field modelling tool. PotentQ is designed for rapid semi-automatic modelling of a single magnetic and/or gravity anomaly using up to three bodies chosen from seven possible geometries. A highly streamlined modelling interface that builds on the simplicity arising from the single anomaly / three body configuration. A specially formulated inversion scheme that generally requires no user intervention. In this image the profile pane of an Oasis montaj database window (bottom) has an anomaly highlighted. PotentQ (top window) has been used to generate the dyke-like model to fit the anomaly. PotentQ allows you to model up to three magnetic and gravity field components simultaneously. 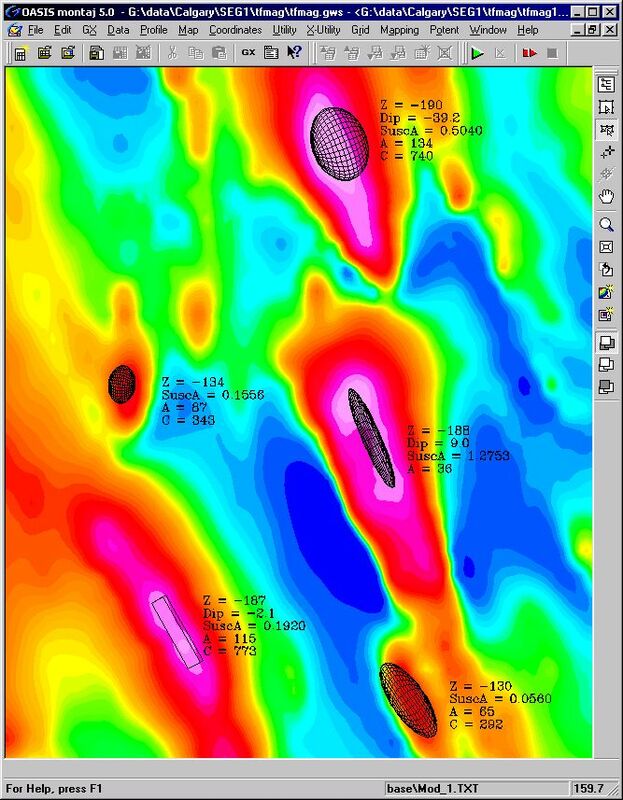 For example, you might model all three components of downhole magnetic data; click here to see an example. PotentQ can operate in any one of three modes, depending on which GX was used to run it, and the type of data. A cross-section window, which contains the observed and calculated field profiles, as well as a cross-sectional view of the body. A plan window, which provides you with a "bird's eye" view of the observations and the body. A tabbed modelling control dialog box, which gives you streamlined control over the modelling process. Downhole mode. This is similar to Profile mode, except that the profiles in the cross-section window are plotted vertically. PotentQ decides whether to use Profile or Downhole mode by analyzing the data. Map mode. PotentQ works on an area of data. Model assessment is done by comparing images (rather than profiles) of the observed and calculated fields. The images are displayed in three Plan windows. Two Cross-section windows help to set the background field. How do I run PotentQ? PotentQProf, which runs PotentQ in profile mode by taking a cross-section of an anomaly from an image, as in the example opposite. PotentQGrid, which runs PotentQ in map mode with data extracted from a polygonal region of a grid automatically loaded into it. PotentQWind, which runs PotentQ in map mode with data extracted from a polygonal region of a database automatically loaded into it. The outline of the interpreted body and its parameters can be posted back to an Oasis montaj map via associated polygon and text files. Use PotentQ when you have a well-defined anomaly, either on a profile or a map, and you want to model it quickly using a single primary body. Typically, you might be scanning along aeromagnetic flight lines, interpreting many anomalies as you proceed. Or you might be trying to quantify the characteristics of the sources causing anomalies over a wide area of an aeromagnetic or gravity grid. PotentQ allows you to process many anomalies very quickly. Consider it as an alternative to automatic methods such as Euler and Naudy deconvolution in those situations where you want to specify the target anomalies explicitly, and retain the ability to exercise control over each individual model. Dyke (2D or finite length). All bodies can be arbitrarily translated and rotated. Body position, and the vertices if the body is of the polygonal cross-section type, can be dragged with the mouse. The field is recalculated and profiles updated in real time as changes are made to the model, effectively animating the calculated field profiles when forward modelling. Inversion parameters are preset for the various body types. All you generally need to do is click the "Invert" button. However, you still have the option of setting your own inversion configuration if necessary. Refer to the description of Potent for more details of how inversion is implemented. You can download a demonstration version of PotentQ from our Downloads page. Refer to the notes on that page for further information.